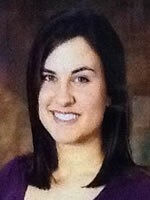 Heather Abadie is an Instructor at Louisiana State University Health Sciences Center New Orleans School of Nursing. She received her Bachelor of Science in Nursing from the University of Southern Mississippi School of Nursing. She received her Master of Science in Nursing in Nursing Education from the Louisiana State University Health Sciences Center New Orleans School of Nursing. She received her Certification in Inpatient Obstetrics from the National Certification Corporation in 2011. Mrs. Abadie serves as course faculty for Women’s Health and Perspectives, and she serves as a faculty advisor to students. Mrs. Abadie has clinical experience in Labor and Delivery and Antenatal nursing as a staff nurse and then as a charge nurse at East Jefferson General Hospital. Mrs. Abadie is the vice-president of the Epsilon Nu chapter of Sigma Theta Tau International Honor Society of Nursing, member of the Association of Women’s Health, Obstetric and Neonatal Nurses, and of the Greater New Orleans Breastfeeding Awareness Coalition. Mrs. Abadie has received honors including being the recipient of the Donna Swartzfager Memorial Award, being named East Jefferson General Hospital’s Team Member of the Month in November of 2012, and DAISY faculty award nominee.